All application materials must be received by March 22. Late and incomplete applications will not be considered. Upon receipt of the scholarship materials, a confirmation email will be sent. Award recipients will be notified by April 2nd . Awards will be presented to the recipients during the KABHE Awards Ceremony. KABHE, is the premier organization supporting diversity efforts throughout the Commonwealth, was founded in 1983 by the late Dr. William Parker (1925-2008), then Vice-Chancellor of Minority Affairs at the University of Kentucky, and other minority leaders in the Commonwealth. The KABHE William C. Parker Scholarship Committee will award two $500 scholarships based on achievement and community service for the 2019-2020 academic year. · Student applicants must be nominated by a KABHE Northwest* region member. · Student applicants must be Black/African-American (non-international) and residents of Kentucky. · Student applicants must have a cumulative 3.0 GPA (on a 4.0 scale) at their current college or university. · Student applicants must be full-time (12 credit hours or more) undergraduate students enrolled at an institution in the Northwest* region. · Student applicants must have demonstrated service to the African American community and have demonstrated service or leadership to the campus/community. (*) The annual KABHE conference for the 2018-19 academic year is being sponsored by the Northwest region. Student applicants must be attending one of the following colleges or universities in the Northwest region to be given consideration for the scholarship: Bellarmine University, Council on Postsecondary Education, Elizabethtown Community & Technical College, Indiana University Southeast, Indiana Weslyan University, Jefferson Community & Technical College, Kentucky Community & Technical College System Office, Kentucky Department of Education, Kentucky State University, Kentuckiana College Access Center, Midway College, Simmons College, Spalding University, Sullivan University, or the University of Louisville. SPECIAL NOTE: It is preferred that all application materials be submitted together by e-mail. All application materials must be received by March 22, 2019. Late and incomplete applications will not be considered. Upon receipt of the scholarship materials, a confirmation email will be sent. Scholarship recipients will be notified by April 2, 2019. IMPORTANT NOTICE: Scholarships will be presented to the recipients on April 12, 2019 at 6:30PM during the KABHE Awards Banquet. Scholarship recipients must be present at the awards banquet to receive the scholarship. 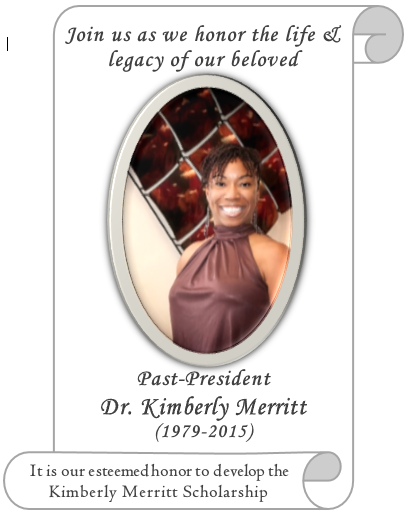 Kimberly D. Merritt received her posthumous doctoral degree (Ed.D) in December 2015 from Eastern Kentucky University. The former President of KABHE and long standing member of KABHE has left a lasting legacy influencing those who came to know her and grew to love her. 3. Traditionally under-represented in academic or institutional programs as it relates to the goal of increasing diversity. This would also include first generation college students, students from impoverished families, and/or students with a history of overcoming adversity. This award is presented to professionals with 1 - 5 years’ experience in higher education who (are actively) involved in KABHE, demonstrating service to the profession, possessing outstanding character, and are potential role models for other new professionals in higher education. Nominations should include specific information identifying the individual’s title, role and service in higher education, demonstrated leadership activities and qualities that would deem them suitable for this award. This award is for individuals who are serving in higher education administration as administrators, professional staff or teaching. Nominations are open to the general membership. Selections are made by the KABHE Vice President and Regional Representatives and presented at the Annual Conference. This award is presented as a tribute to the late Dr. Joseph McMillan to honor his legacy as Co-Founder of the Kentucky Association of Blacks in Higher Education and for his outstanding leadership, service, research and teaching. The award will be given to a current tenure-track faculty member in Kentucky, who is a member of the Association and has a demonstrated record of scholarly research, service and teaching. The award will be presented to salute and highlight the state’s top minority talents in academia. To nominate candidates, send the names and background information of any outstanding, high-achieving, award-winning, path-paving and/or highly regarded academic that is currently serving as a full-time teaching faculty member in a postsecondary institution in Kentucky. Include information on research, service and teaching to support your nomination. This award is selected by the KABHE Executive Board and presented during the Annual Conference.